Yay! I’m so excited to finally start recapping our two week trip around Scotland, Northern Ireland and Ireland. We had such an amazing time! I have so much to talk about so I’m going to break it up into multiple posts. 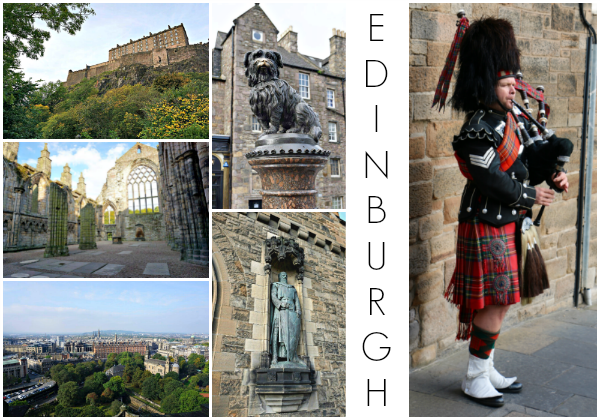 Today I’m just going to talk about our first stop – Edinburgh, Scotland! Before I jump into the first day of our trip, I want to quickly talk about our trip as a whole. I guess the first thing to mention is that when I say we, I’m referring to my mom and me. We left the guys at home and took a girls trip! This was our third international adventure with just the two of us and we travel so well together. I do all of the planning and my mom just goes along with the plans (which works best for both of our personalities). Four years ago we went to London and Paris and I planned and booked the entire trip. Two years ago we went to Italy with a tour company (Go Ahead Tours). I was against it at first, but we found a great company with the perfect itinerary and had the best time ever. So for this trip, we decided to travel with the same company. My mom is getting older (and had knee surgery a few years ago) so it’s really just easier for her on these long trips to not have to deal with the heavy luggage or run around catching different public transportation. I have to admit that it’s really nice not having to worry about any of the logistics. Anyway, we took the Landscapes of Scotland and Ireland tour with Go Ahead Tours. That’s the same company we used for our Italy trip and we really enjoyed both trips (although the Italy tour was a little better). Our guide for the trip was Mansel and he did such a great job keeping everyone together and making sure we were all having a good time. Our bus driver in Ireland, Paddy, was the best ever…like I legit cried when he dropped us off at the airport. So officially we spent two full days in Edinburgh, but the first day was a travel day and we were zombies by the time we landed. We flew out of Phoenix Sunday morning and arrived in Edinburgh Monday morning. It was seriously the worst timing. We were so tired, but our room wasn’t available yet since it was only like 9:30 a.m. We went to get breakfast and I got this amazing bowl of porridge with plums, but I was so tired I couldn’t enjoy it. We tried to walk around a bit, but we just wanted a nap. Around 11 we went back to the hotel and practically begged the girl at the desk for a room. Luckily our room was ready and she was amazing so we were able to check in early. We spent the rest of the day napping before meeting our tour group for dinner. 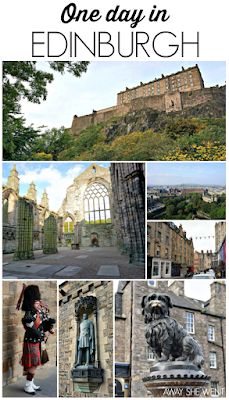 OK, enough blabbing, let’s talk about our day exploring Edinburgh. We started the morning with a bus tour around the city with a local guide. 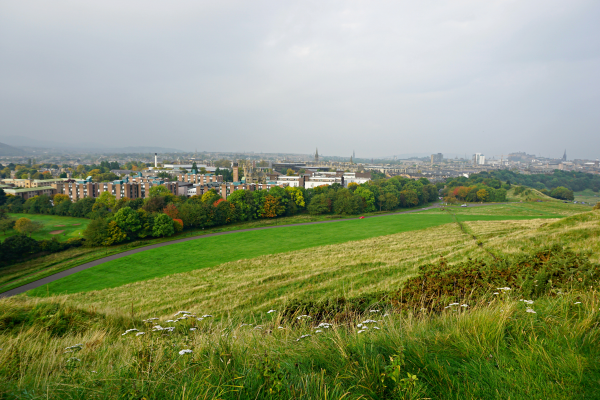 We went through New Town, around Holyrood Park (that view! ), and back through Old Town to Edinburgh Castle. 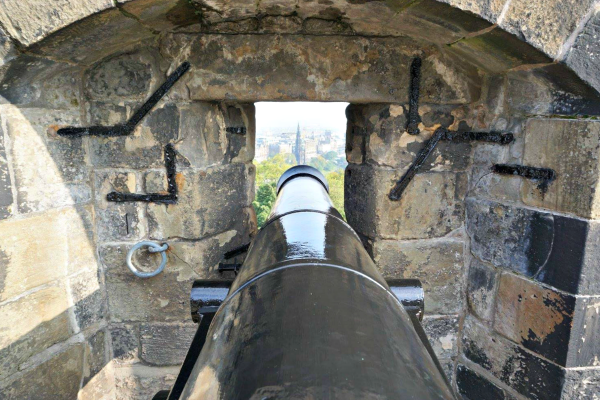 We went to Edinburgh Castle with our group and our guide took us through all of the gates to the front of the building where the Crown Jewels of Scotland are kept. From there we were free to explore the castle on our own and had the rest of the day to ourselves. Edinburgh Castle is a historic fortress built on Castle Rock, which was formed after a volcano eruption 340 million years ago. 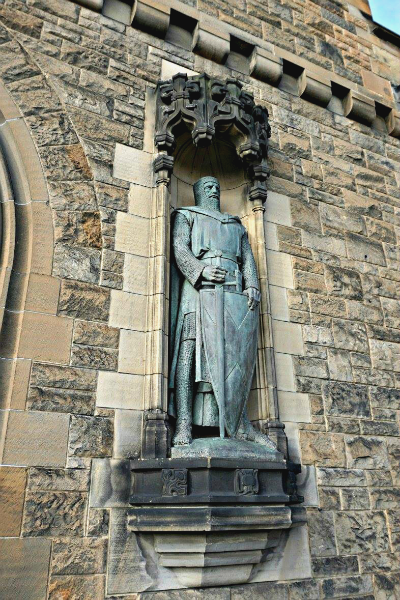 Edinburgh Castle was built during the 12th century by David I. Because of its strategic location, the castle was almost always under siege (whoever held the castle held rule over Edinburgh and therefore all of Scotland). 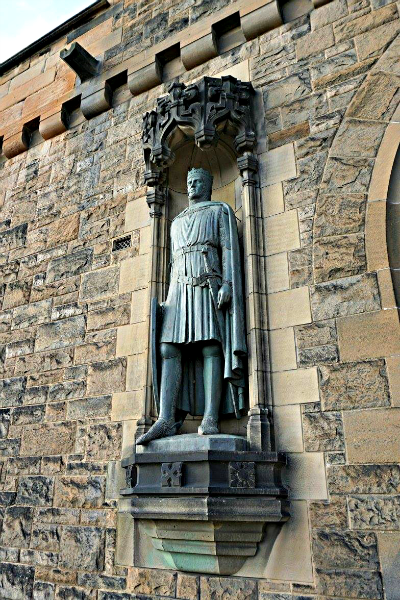 The castle bounced from English to Scottish rule for centuries during the Wars of Independence, the Lang Siege, and Jacobite Uprisings. 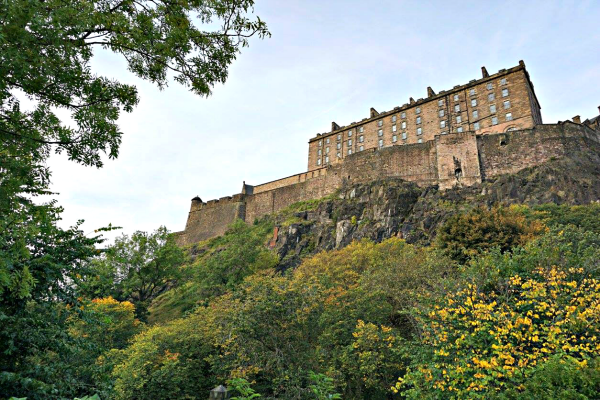 During the late 18th century – early 19th Edinburgh Castle was used to hold military prisoners, but became a national monument in 1815 after a mass prison break proved it could no longer hold prisoners. The castle was restored during the 19th and 20th centuries and is now one of the most popular tourist attractions in Scotland. We spent about an hour after exploring Edinburgh Castle. We saw the Crown Jewels and visited the Scottish National War Memorial and St Margaret's Chapel. 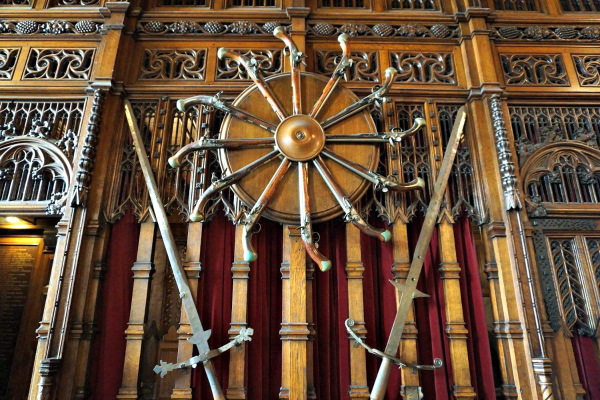 We also visited The Great Hall, which was probably my favorite space. 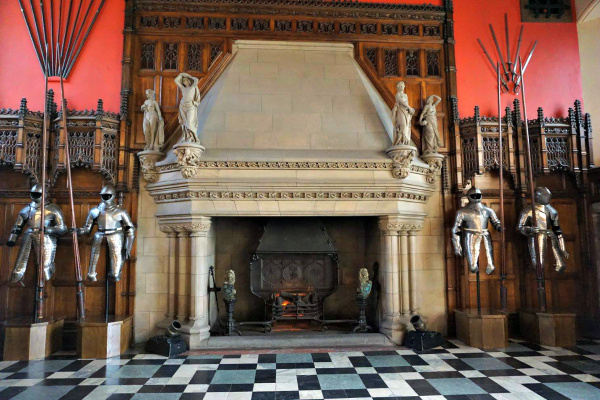 I loved all of the armor, weapons, and of course that giant fireplace! The view of the city from the castle is amazing. You can see why it was so important to control the castle in order to rule the city. After our visit to the castle we decided to do some shopping on Victoria Street and the Royal Mile on our way to the Palace of Holyroodhouse. Victoria Street is easily accessed by the first roundabout from the castle (take Upper Bow and then take the stairs down to Victoria Street). Victoria Street is full of colorful buildings and small shops. 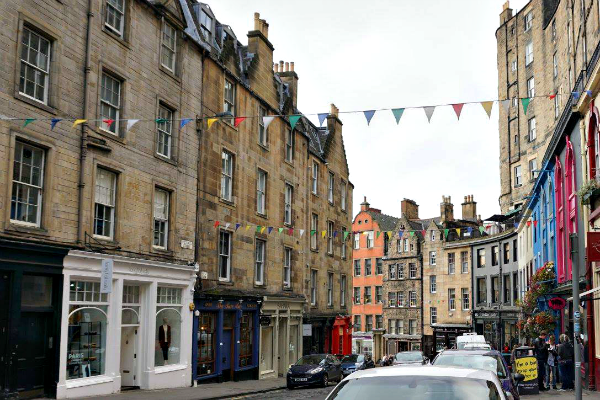 The street (and adjacent Candlemaker Row) is thought to have been the inspiration for Diagon Alley in the Harry Potter series. We continued on to the Greyfriars Bobby Statue. 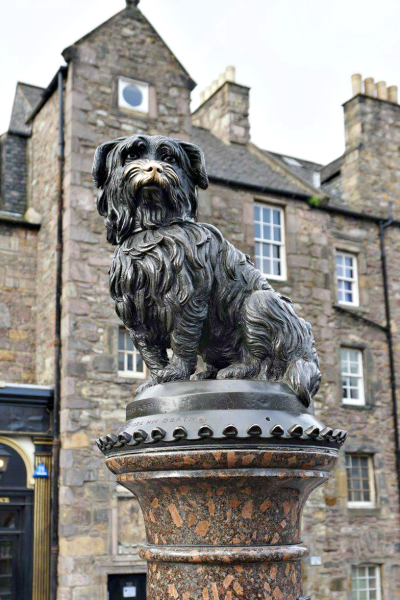 The statue was built in memory of a terrier from the 19th century who supposedly spent 14 years guarding the grave of his owner. Rubbing his nose is supposed to bring you luck…you can see his nose has been rubbed a lot over the years. From there we walked back up to the Royal Mile for some shopping. There are a lot of touristy gift shops on the street, but there are also some cute, small shops too. We bought Christmas ornaments at a Christmas shop, some locally made lip balm and chocolate at another shop, and haggis flavored dog treats at another. 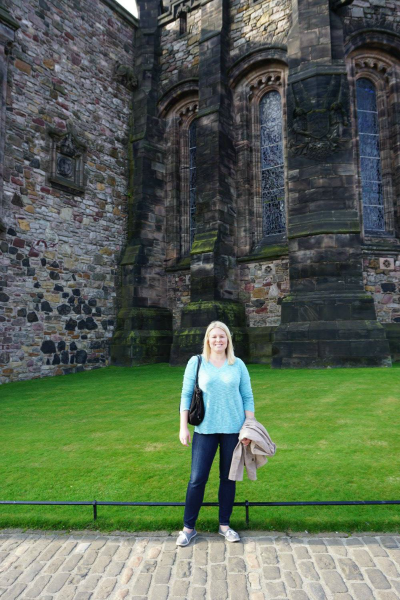 Once we made it down the Royal Mile we decided to explore the Palace of Holyroodhouse. The palace is the Queen’s official residence in Scotland. It’s best known as the home of Mary, Queen of Scots during her short reign in the 16th century. At the palace you can explore 14 of the rooms, the ruins of the 12th century abbey, and the royal gardens. 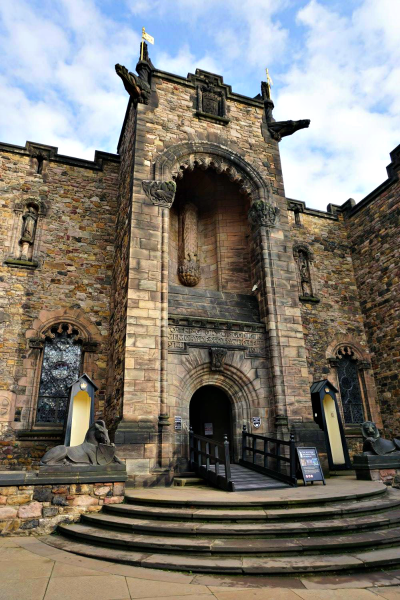 The tour includes an audio guide of the rooms, but it’s mostly about Mary, Queen of Scots. She lived an interesting life, so the audio guide is definitely worth a listen. Once we made it through all the rooms we headed to the abbey ruins. The abbey was founded in 1128 by King David I. According medieval legend, while hunting in the area, David saw a vision of a stag with a cross glowing between its antlers. He saw this as an act of God and declared that the abbey should be built in that spot. 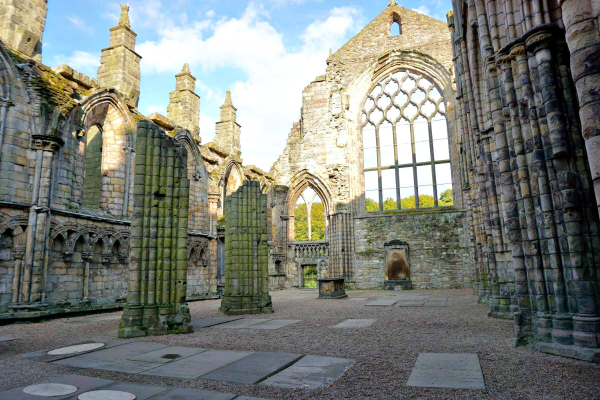 The abbey was damaged throughout years of war and revolution. 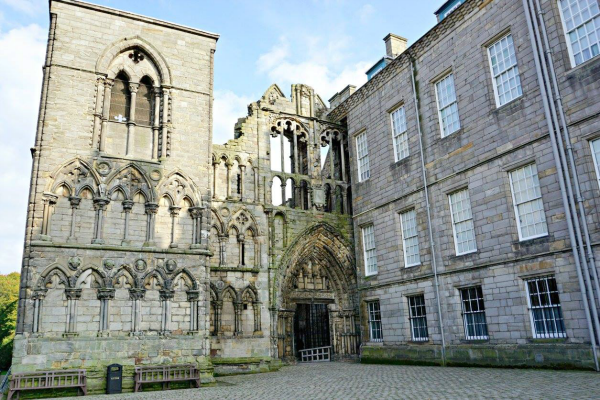 The roof eventually collapsed in 1768 and the abbey has been a roofless ruin since then. Restoration of the abbey has been proposed several times, but has always been rejected. I personally like how the ruins look and I think it would be a shame to restore it. 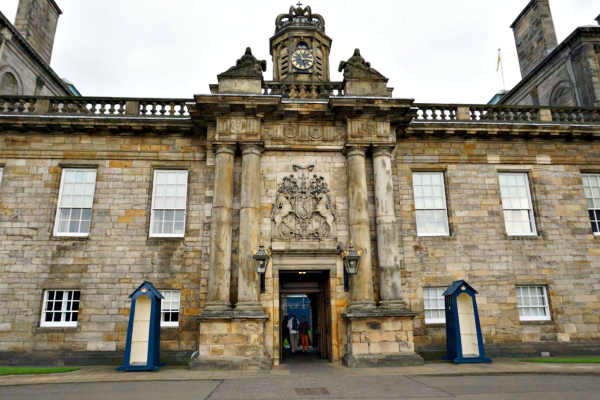 Once we were done exploring the Palace of Holyroodhouse we caught a cab back to our hotel to drop off our stuff and rest up a bit before dinner. 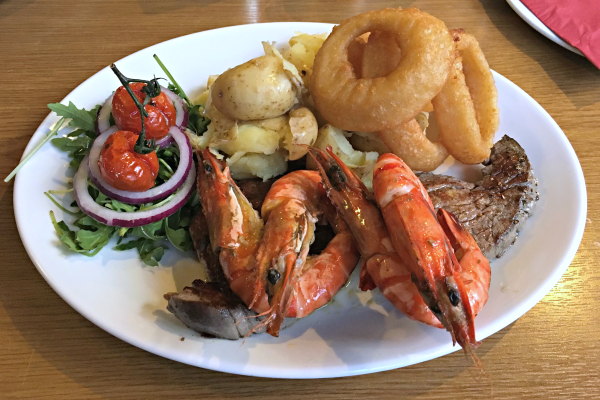 We had steaks and prawns at McKirdy’s Steakhouse for dinner and it was the perfect way to end a fun day in Edinburgh. I wish we would have had a couple more days to explore Edinburgh, but I feel like we made the most of our day. Hopefully someday I'll have a chance to go back and check out the rest of the city and sights! Beautiful pics. It looks like a wonderful place to visit. I must add it to our list for when we're able to travel again! Such a beautiful place, for sure!! Adding to my list to visit one day. I have serious wanderlust! We spent two weeks this past spring there and loved every moment. Felt like home and would love to go back and stay for an extended time. Such a gorgeous place! And the food looks amazing! I would love to visit Scotland someday! OMG it looks gorgeous there, and the architecture is amazing! Definitely on my bucket list! 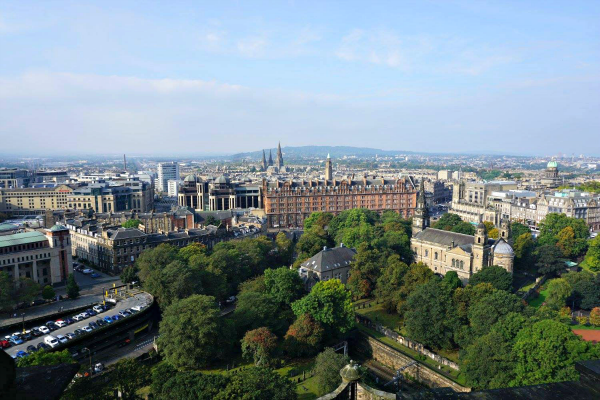 I am dying to go to Edinburgh, it looks so gorgeous. What an amazing trip filled with memories! Looks like you both had a good girls trip! I'm going out of the country for the first time next year and although it is just for a cruise I'm excited! I hope to travel more often after I get my feet wet *literally. Those pictures are breathtaking! I LOVE old architecture! Sounds like a great girls trip! Wow Scotland is breathtaking! I'd love to visit there someday! Awww, girl's trip!! That's the best! Would love to explore Scotland with my mama. 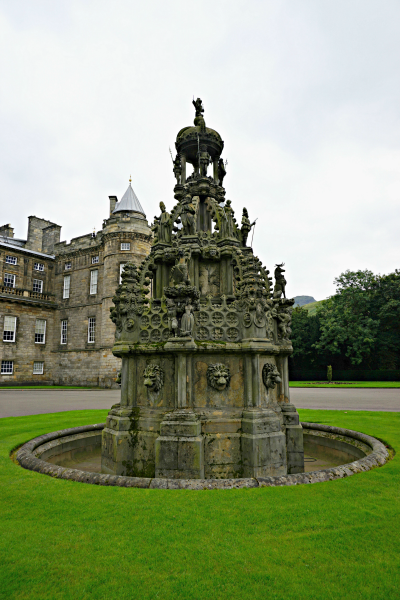 The Palace of Holyroodhouse looks like such a neat place to explore. Those pictures of the old abbey?! Absolutely beautiful! I think that would probably be one of my favorite things to explore there. Can't wait to see more of your trip!